Add to Cart TRENDnet's TU-700, a 7-port USB Hub, is a highly integrated device that includes seven advanced USB ports. The USB Hub allows a wide variety of legacies and other peripherals to be connected and controlled by USB enabled systems. 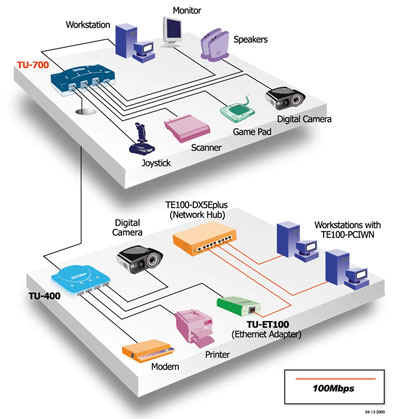 The easy Plug and Play (PnP) function allows PCs to be connected to monitors, printers, digital speakers, modems, digital cameras, joysticks, and other USB devices. The TU-700 features power control and over-current detection on each of its seven downstream ports. Featuring data access rates of up to 12Mbps, the TU-700 is ideal for your high-performance USB solution. Compatibility: 7-port USB Hub is compatible with Windows 95/98, Windows 2000, iMac, Mac G3, so it is ready to work as soon as the users plug it into PC. Flexibility: Allows a variety of legacies and other peripherals to be connected. Expandability: Able to daisy-chain to additional USB Hub that allows the use up to 127 devices at the same time. Speed: Provides high-speed of 12Mbps and low-speed of 1.5Mbps operations mode.